Does the New Echo Show Steal the Show Vs The Echo Spot? We think so. Amazon has a full line up of Amazon Echo devices, but how do you know which one is right for you? The New Amazon Echo Show & Amazon Echo Spot both offer a lot of the same features but the Echo Show does have three features that set it apart from the Amazon Echo Spot. The Echo Show has a larger screen, at 10” it offers the a large viewing screen that makes it comfortable to watch videos on. The New Echo Show has a built in smart home hub with Zigbee communication that allows you to control select Zigbee devices like the Phillips Hue light bulbs. The New Echo Show has two dual 2” speakers to provide rich sound quality while the Echo Spot only has one 1.4” single speaker. Is the built in smart home hub on the Echo Show worth it? The built in smart home hub on the New Echo Show is designed to work with Zigbee smart home devices. The issue is that not all smart home devices work on Zigbee and the general trend is that more and more devices work on wifi and don't require a smart home hub at all. Our smart home light switches work with Alexa and don't require a smart home hub, just a connection to a wifi network. There are a limited number of devices that work on Zigbee and most of those devices have compatible wifi alternative devices that don't require a smart home hub at all and still work with Amazon Alexa. However since your basically getting the built in smart home hub for free with the New Echo Show, this extra feature is a nice addition that allows you flexibility in planning your smart home devices. What is the advantage of the Amazon Echo Show vs the Amazon Echo Spot? With the built in smart home hub on new Amazon Echo Show if you want to connect phillips hue light bulbs or other Zigbee devices you don't need to purchase a separate phillips hue hub, you can just buy the phillips hue bulbs and connect them directly to alexa. However even though you can connect phillips hue bulbs directly to alexa, long term if you want to control your smart home lighting with voice you should install a smart home switch as it is a permanent solution that will add value to your home. The issue with installing phillips hue light bulbs in light sockets is that if someone turns off your light switch the phillips hue bulb will not longer have power or connectivity and you won't be able to control the phillips hue bulb, this is the most common complaint with using phillips hue bulbs. However they are a quick simple solution if you are renting your apartment and want to easily add smart home control. Related Post: Learn About Zigbee, Z-Wave, Wifi & Other Smart Home Protocols. With the 10” screen sleek exterior the New Echo Show wins in the design category. With its full screen and mesh exterior you can watch a movie or video on the screen comfortably. The new echo show has an interactive touch screen which is much easier to control than the echo spot because of its larger format and larger buttons. When your buying smart home devices for your home you generally want devices that blend in to your home and the echo show does just that. The echo show comes in both charcoal and sandstone so you can choose the finish that works best for your design. You can’t go wrong with this top of the line Amazon Alexa device. It really is a smart speaker, tablet, camera and smart home hub all built into one device which offers incredible value. The New Echo Show has two built in 2” speakers vs the Echo Spot’s single 1.4” speaker. The sound quality on the new echo show is noticeably richer and higher quality. Both devices do the job playing music but if you want high quality sound with Amazon Alexa built in you should get a sonos one, with integrated amazon alexa. The sono's one has all of the same features of the amazon echo, with the exclusion of the smart screen but with the quality sound Sono's is known for. Related Post: Is Sonos Worth it? Amazon is always running promotions on their devices so if you keep looking your always going to find a deal on one or the other of these devices. However in general the Echo is 40-60% less expensive than the Echo Show. If you like the smaller format and clock style of the echo spot it can also be a great addition to any room. Both devices are top of the line but you get more of everything with the Echo Show, and that drives up the price. Both devices are compatible with over 20,000 smart home devices according to Amazon but as we covered above the New Echo Plus does have Zigbee communication built in so it wins in this category. The New Echo Show is a huge upgrade from the original Echo show and offers more of everything than the Echo Spot. A larger screen, better sound quality and a built in Zigbee smart home hub make the New Echo Show a compelling value. With the both the Echo Show & Echo Spot you can view video feeds from your smart doorbell or smart camera, stream amazon movies, have a video chat and play song lyrics on the screen while listening to music. Amazon is adding new video features to the both the New Echo Show and Echo Spot everyday which make any Amazon Echo with a screen more valuable. What Can You Do With Echo Show & Echo Spot? 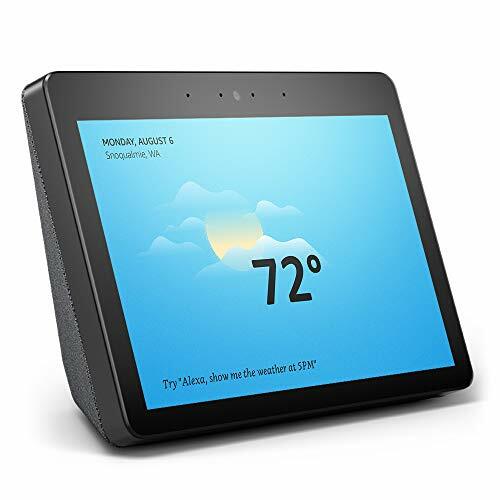 With the Echo Show and the Echo Spot you can view and display live video from connected wifi smart cameras on the screen one the Echo Show or Spot. Both devices work with Nest Cameras, Amazon Cloud Cam, Ring Cameras, Blink Cameras and Arlo Cameras. Related Post: Does Alexa Work With Nest Cameras? Just like smart cameras you can view your smart video doorbell on your nest camera. Don’t know who’s at the front door and away from your phone or on a call? Just ask Alexa to show you your front doorbell feed. Both the Echo Show & Echo Spot allow you to watch the any prime video on right on the screen. Just say “Alexa, play Jack Ryan” and in a few moments your Amazon Prime Video is live on your screen. Free prime video’s are included if you have Amazon Prime. Both the Echo Show & Echo Spot allow you to music just like any other Amazon Echo device but what makes it even better is that the lyrics display on the screen while it’s playing the song so you can sing along if you want. 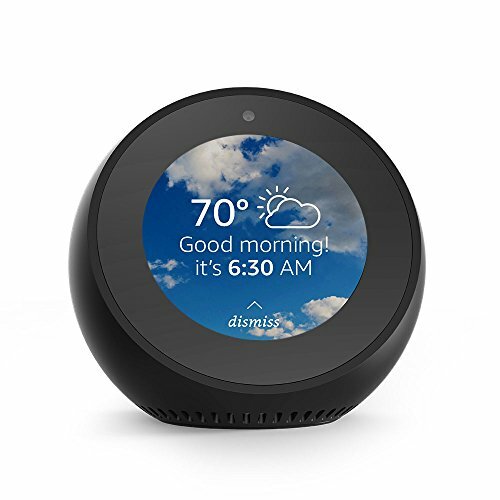 When you ask Alexa to show you the weather, she will show you the daily forecast and the extended forecast on Echo Show & Spot. The weather forecast includes temperatures, rain or sun symbols, humidity and other relevant weather information. Use Amazon Echo Spot & Echo Show as a Clock. Yes, you can use the other Echo devices as a Alarm clocks to wake you up, but you they don’t display the time anywhere. With Echo Spot & Echo Show there are dozens of clock faces to choose from that will display the time, you can even personalize the clock faces with your own photos if you choose. I personally like using the Echo Spot as an alarm clock because it’s small form factor is unobtrusive on my night stand. You can subscribe to Alexa skills that will will give you updated video and sports news clips directly on your Amazon Echo Show or Spot. The default settings on the Echo Show and Echo Spot will show you shipping and delivery notifications for any items you have recently ordered on Amazon. It’s a nice feature to keep track of your packages and make sure you don’t leave anything sitting outside on your front porch. Does the Nest Hello Work With Alexa? Does Alexa Work With Nest Cameras?